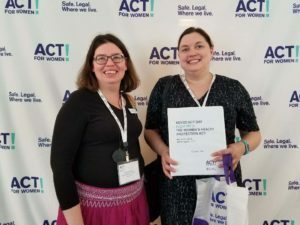 Earlier this month, I joined Andrea Irwin, the Center’s Executive Director, to travel to Washington, DC to take part in a national day of advocacy – Act! For Women, in support of the Women’s Health Protection Act (WHPA). There we joined forces with a contingent from Grandmothers for Reproductive Rights (GRR!) to lobby our representatives and make sure they know access to abortion is important to Mainers. All told we joined a group of 104 people from 23 states and the District of Columbia to inspire and be inspired and to take to the Hill to make our voices heard. Mabel Wadsworth Center is actively involved with two national campaigns: All* Above All, to lift bans that deny abortion coverage & WHPA. A key goal of All* Above All is to repeal the Hyde Amendment, which prohibits federal funding for abortion care. Hyde prevents anyone with federal insurance such as military families from having abortion covered and prohibits federal dollars being used for abortion coverage in state programs. WHPA is federal legislation that protects abortion access and nullifies oppressive state restrictions such as Targeted Regulation of Abortion Provider (TRAP) laws, forced ultrasounds, forced delays, and procedure bans. WHPA expressly prohibits any restriction that is not based on science or good medical practice. Even though Roe v. Wade is the law of the land, a precedent further strengthened by Whole Woman’s Health v. Hellerstedt in 2016, our rights are under threat across the country and harming women. With a Supreme Court that could be in flux as early as this summer, we must have federal legislation that protects our constitutional rights, no matter where we live. Since 2011, states have proposed over 400 anti-abortion restrictions that chip away at Roe v. Wade. What the country has now is a patchwork of restrictions with no rhyme or reason, except that in conservative, red states women face more barriers than in others. The restrictions have no medical basis and no consideration based on the health of the pregnant person. Instead they are based on mostly religious ideology, which should not be forced upon the rest of the population. Not all of these bills have been enacted, but each unconstitutional advance forces a judicial fight that takes away scarce resources. Organizations must use their resources to fight for the right to provide care instead of focusing on the care itself. This is unacceptable. The passage of WHPA would prevent states from enacting spurious laws that only seek to shame and control women. And if these laws are enacted, WHPA will streamline any defense necessary to make sure there are minimal barriers to abortion care. Our contingent from Maine met with staffers from all four of our Congressional delegation – Representatives Pingree & Poliquin and Senators King & Collins. While some may think lobbying is only for corporations with deep pockets, taking our concerns to our elected officials is one of our greatest responsibilities and privileges as citizens. We brought our own stories and experiences around abortion care to highlight the need for WHPA. Having members of GRR there who have experienced life before Roe v. Wade brought home the seriousness that abortions will not stop, only safe abortions will end as barriers increase. There was visible impact as the stories were shared. I was able to share my abortion story as a resident of Maine having an abortion out of state while I was in college in Massachusetts. When I found myself pregnant, my first thought was that I can come home to Mabel’s for care. I knew care was accessible in Maine, but did not know the laws and restrictions in neighboring Massachusetts. I come from a place of privilege, in which I could travel home to Maine. Many others are not so fortunate to be able to travel for care. They are forced through draconian measures to receive care, or are unable to obtain an abortion at all. It should not matter what state a person is in, what zip code they are in, they should be able to access healthcare. Andrea was able to speak from the provider’s perspective. Mabel Wadsworth Center helps so many people as they seek to terminate a pregnancy. There are as many different reasons people seek abortion care as there are people. As a Center we are fortunate that we can provide the necessary care without unnecessary and unwarranted restrictions. As Andrea noted, she speaks with clinic directors all over the country that do not have this freedom and are burdened by the barriers they face in caring for their clients. We had successful meetings with all the staffers. Rep. Pingree and Sen. King are currently co-sponsors of this important legislation. Our meetings there were to thank them for their support of abortion access and to ask them to speak out to others on the importance of abortion care and personal autonomy. Rep. Poliquin and Sen. Collins, however, are not co-sponsors. With Sen. Collins’ office, we were able to educate and advocate. We dispelled some myths on the safety of abortion and how restrictions are not based in health but in control. While we knew going in that Rep. Poliquin opposes a woman’s right to have an abortion, we were able to make our views known that for us, pro-life means women’s lives have importance that outweighs the potential life of a fetus. It is the life of the woman and their ability to make the best choices for themselves free of government interference that is essential to our ability to participate equally in society. In all cases, we were able to let our representatives know that abortion access is important for the people of Maine. That while we as a state are free from many legal barriers, any unconstitutional threat to reproductive care anywhere in the country is a threat to our own autonomy.